Cagiva's Castiglione brothers determined to create their interpretation of trailie fashionable genre in the early 1990s they were using 750SS Ducati desmo twin motors because that's what they have. The result is a large ENDURO tool they call Elefant and so successful they offer a 900 motor and show them the way to go. The result is a large ENDURO tool they called Elefant. Motive power was provided by Ducati: two-valve, air-cooled L-twin motor has a pedigree going back to the middle 1970's when a talented designer Fabio Taglioni Pantah write 500cc. He will leave the cam gears bevel support belt-driven camshafts, adding rigid one-piece crankshaft and spin-on oil filter (which comes from Simca Aronde!). The design of this machine, and this, so the sound has changed slightly; some sections will remain interchange. Six-speed gearbox has the same ratio as the old bike.
. Cagiva end gearing is slightly shorter, though, to improve the performance of mid-range and test it out on the bike 185km / h, with a rev-counter in the conservative 7500rpm. Motor surprisingly went well for a big twin, abundant Taglioni statement showing that the 90-degree L-twin has perfect primary balance; the only rocking vibration is high frequency caused by a cylinder offset. It will be interesting without any juddering from the above 2000rpm, so very strong in four and remained like that until after eight. The midrange is very torquey (72Nm at 5200rpm!) And short shifting is the order of the day, there is really no need to over seven rounds, although the famous desmodromic valve system is not possible to get up the valve. Its main advantage is that it allows very abrupt cam profiles without the leveling curve - a large valve opening and closing like a slammed door, with a corresponding improvement in gas flow sequentially timed injections - one per cylinder - to take full advantage. I was expecting more mechanical rattle but Gran Canyon walk very slowly without the full reward from SS to channel sound to the driver motor. Belies the dated engine and conservative pedigree (by today's standards) specifications, riding a bicycle without fuss or temperament. This motor shares with the family only 916 multi-plate dry clutch in series production, but with different friction material. While SPS 996 tested in 1998 I had a clutch go on and off like a light switch, Gran Canyon is blessed with a progressive action outside the ordinary. Its take-up a bit suddenly, it became clear grabby when hot, but always unpredictable and just take the same point, hot or cold. Six-speed gearboxes all have indirectly the same ratio as the old bike and have the same smooth, crisp-as-glass-breaking action, although the gear lever was again given birth again to throw. However, within 10 minutes taking the test machine from the supplier Boland Bikes in Jambi, near Cape Town, I'm making without the benefit of seamless upchanges clutch. Because the bicycle mileage so low that I did not try downshifting without the left hand but downchanges conventional light and positive, if less vocal low revs. This user-friendly drivetrain mounted in a frame grille mediocre made of square-section steel tube with two large triangular plates stiffen the head stock area. This motor is designed to be fully stressed chassis member and used as such in this application, so no downtubes or holder under the sump. The extruded aluminum swing-arm rotated in classic Ducati fashion on the rear axle shaft gearboxes but extended to mount on the frame for extra rigidity, ahead of Honda-hyped many applications of the same idea six years. Link rear suspension has risen, and the level of Boge shock absorber adjustable for rebound and spring preload while the 19-inch front wheel rides 45mm conventional Marzocchi forks, amazing and free from flexure stiction - and they should be given their impressive diameter - but without adjustment. Braking is provided by Nissin Japan specialist and at first sight was dull, with twin-piston calipers on 296mm floating discs, but seen in this case deceptive. Gran Canyon has some of the most powerful brakes have not adjusted to the so-called dual-purpose bike, with no lever on the side of travel and rapid response. Lever effort is a little high and not much sense what is going on between the rubber and the road but, with a little practice, Cagiva can be made to stop within the distance that will raise eyebrows, even among sport bike riders. Rear brake also works better than I expected, considering other technologies that lower floating calliper set-up, but should be used with caution because it will lock with little provocation. Body panels have a typical style of the signature of South African designer Pierre Terblanche all over them, there are no sharp edges or straight lines. Everything organic curved and smooth. The prize is neat waisted along the top of the fuel tank (yes, Cyril, tanks) to separate the bicycle from the center of the basket. Nothing sticks out - the indicators are installed neatly circular cut-out at its widest point and the center module built-in mirror, rear carrier tail cut line, so the only example I've seen that looks designed-in rather than added-on. The main edge is thickened and rounded, so be very practical and convenient grab-handle for the passenger. Large air box above the throttle body fuel injection would make the conventional saddle tank unattractively hump backed, and increasing quite the center of gravity when full, so right Terblanche twin 10-liter plastic tanks on either side of the frame, the plane is identical to the filler cap style side by side in separate center panel. Tank is by Siamesed balance in the context of pipe under the fuel tank is drawn evenly from both sides but it is much easier to fill an individual - and so cool! The only weakness of this arrangement is that the front of the saddle a little wide and I found that it caught me on the inside of the thigh, which took a little getting used to. 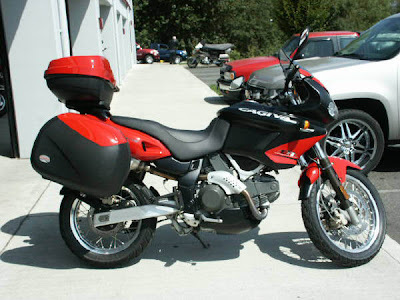 Moreover, the position of a great seat, the saddle is very wide and soft, with just a little step into the country pillion and plenty of room for both pilot and navigator to move the long ride. Wide handlebars very little rise but the head and the wheel of the three clamps are relatively high so that the hand position just above elbow height, the right to trailie great, if slightly up to speed can be achieved. Control the fat and positive in operation, car-style fascia is neatly styled with speedometer, rev-counter and (hooray!) A watch with real life, plus the usual idiot lights, wrapped in a faired - right in the pod - really hard to photograph because of glare from the clear cover. However, the flight deck to get the highest score for neatness, fit and finish. With the upright position and saddle height of 825mm - high for a road bike if it makes sense to trailie - and the wide bars give a lot of maneuverability, the Cagiva commuting in heavy traffic to handle with aplomb. Motor stable up to walking pace and you can see above most of the tin-top and plan to move two and three cars in front. On the open road to protect the small screen with a good up to more than 160 km / h, and rock-solid bike to top speed, and immune to crosswinds. A supple suspension soaked up bumps like a luxury bus and a total lack of vibration makes the bike a friend who is very relaxed. My only excuse is that the seating position a little too sit-up-and-beg-day for all the comfort, unless you're into touring at speed relatively simple - such as around the legal limit. There are at Twisties that this bike came to himself; the Gran Canyon is a trailie who think it is a sport bike. This can be turned around like a bike that much lighter because of the leverage provided by the bar width. The fork is a little underdamped, which appears as a slightly choppy ride in the city and different tendency to "pogo-stick" when pushed hard on bumpy corners. Never get out of hand and hold a line like the bike was on rails, but the front wheels can be made to feel nervous, not like the front end planted as Italy should be. It must be said that the bike path is not open great comfort in the small level due to the flexible suspension, so I feel that this is an acceptable compromise. Cagiva's Gran Canyon is more than a road bike than the styling would suggest, though as sure-footed on a gravel road as the light of other tourists and 193kg better than purpose-built several mudpluggers. However, this extraordinary competent at the tar; it will go back and forth, it will tour, needed two comfortably and it will give the kind of Sunday morning to make up a valuable Motorcycles. Build quality, fit and finish will stand comparison with the best in the world and the design shows real insight into what actually motorcycle; was cohesive, smooth and very practical. Thanks to Robbie Perold at Boland Bikes for our own loans Gran Canyon - the only cost R56 995. Motor: Air-cooled four-stroke 90-degree L-twin. Bore x stroke: 92 x 68mm. Valvegear: SOHC with 2 valves per cylinder desmodromic. Clutch: Hydraulically actuated dry multi-plate clutch. Transmission: Six-speed gearbox with chain final drive. Suspension: 45mm Marzocchi cartridge forks at front, Boge Monoshock adjusted for preload and rebound damping at rear. Brakes: Twin 296mm discs with Nissin twin-piston floating calipers in the front, 240mm disc with twin-piston Nissin floating calliper at rear. Tires: Front: 110/90 - 17 tubeless. Rear: 150/70 - 17 tubeless.